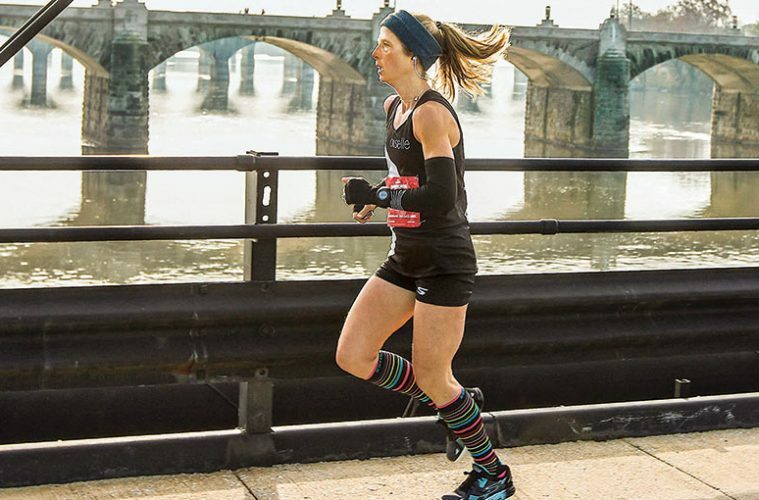 In addition to her running ambitions, Rebecca (Jewett) Trachsel ’97 is a high school cross country and track team coach in Lexington, Mass., and a mother of two. Just three weeks earlier, while running the Shamrock Marathon in Virginia Beach, I injured my calf. I thought I would need months to rehabilitate, but here I was, getting ready to try again. And not only try again, but attempt to hit the goal I’ve been chasing relentlessly since the fall of 2015: to run a marathon in under three hours. I’ve always been a runner. Running was something I did for fun, to work through problems, or simply to check out mentally. In high school, the track coach convinced me to join the team, and I quickly fell in love with the feeling of flying around the oval. 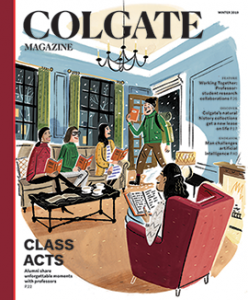 At Colgate I joined the cross country and track teams. The adjustment to the harder training, along with college in general, was a challenge, but I committed myself fully. After graduation, while I still ran occasionally, I was focused on my career and navigating life beyond college. Ten years later, I was married with two kids, and I decided I wanted to run the Boston Marathon. You know, just for fun; a bucket list item. To qualify, I ran a local marathon: I needed a time of 3:40, I finished in 3 hours and 39 minutes. It was one of the hardest things I’ve ever done, and I was thrilled that I’d pulled it off. At the same time, I couldn’t believe I was going to do it all over again. I told myself, after Boston, I would officially be done with marathons. Fast forward to 2015: I was 40 years old, and I was lining up in Albany, N.Y., for my 12th marathon. My personal record was 3 hours and 11 minutes. I’d been working with a coach and increasing my training intensity, which was resulting in faster times. For this race, I was feeling nervous but cautiously optimistic. As I ran, every mile felt better than the last, and I knew something magical was happening. I found a new gear for the last 10K, and my smile grew bigger with every step. Elated, I crossed the finish in 3 hours and 4 minutes. I had no idea this was a possibility; suddenly, I had to readjust my thinking. Since then, running a sub-three-hour marathon has been my only goal every time I start a marathon. I have attempted it on eight occasions. Twice I have run 3 hours flat. Last winter, in the Harrisburg Marathon, I crossed the line in 3 hours and 7 seconds. With each near miss, I had pushed beyond a place I’d never thought I could go, but rather than celebrate, I was frustrated every time I didn’t see a 2 on the clock. In my last attempt, I crossed the line in 3 hours and 1 minute. For days, I was down on myself and running in general. Then my husband, Jeff ’96, said, “Maybe you need to let go of the time goal for a while. It doesn’t mean it’s not going to happen. I just don’t think it always needs to be your main focus.” It was exactly what I needed to hear. I’d started to lose the joy of running, and, as a result, forgotten why I do it in the first place. I love to train and race, not only to do well, but also because I enjoy the experience as a whole. I’ve lost sight of that lately. My story is not over — this is just a new chapter. This fall I will line up for my 22nd marathon. I will train as hard, if not harder. I will try again. But my main goal will not be time. It will simply be to run well and be proud of the outcome, no matter what. Update: On Oct. 21, Trachsel ran the Baystate Marathon and made her goal with a time of 2:59. Listen to Trachsel’s playlist, “Trax Race Against Time” below.